Heat-tracing systems can be divided into two broad classes, electric and fluid. Fluid heat-tracing systems utilize heating media at elevated temperatures to transfer heat to a pipeline. The fluid is usually contained in a tube or a small pipe attached to the pipe being traced. If steam is the tracing fluid, the condensate is either returned to the boiler or dumped. If an organic heat-transfer fluid is employed, it is returned to a heat exchanger for reheating and recirculation. In general, heating of tracing fluids can be provided by waste heat from a process stream, burning of fossil fuels, steam, or electricity. Electric heat-tracing systems convert electric power to heat and transfer it to the pipe and its contained fluid. The majority of commercial electric heat-tracing systems in use today are of the resistive type and take the form of cables placed on the pipe. When current flows through the resistive elements, heat is produced in proportion to the square of the current and the resistance of the elements to current flow. Other specialized electric tracing systems make use of impedance, induction, and skin conduction effects to generate and transfer heat. 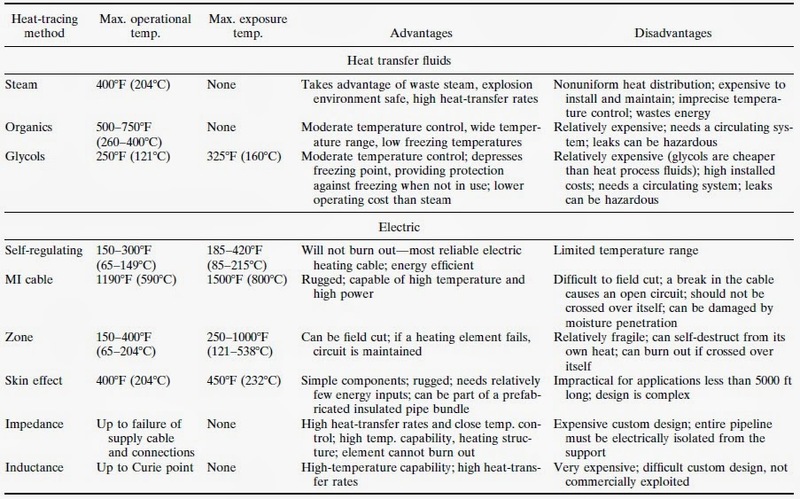 Table A lists the operating and exposure temperatures and the principal characteristics of the different types of heat tracing. A number of desirable features made steam the original heat-tracing system of choice to maintain process temperature and provide freeze protection. Steam’s high latent heat from vaporization is ideal for heat-transfer applications. Only a small quantity is required for a large heating load; and it can heat a line quickly, condense at constant temperature, and flow to the point of use without pumping. Steam is universally available and non-toxic. Today, energy efficiency and minimization of expensive labor are priority considerations in selecting an economical heat-tracing system. With the advent of highly reliable electric heat-tracing, the popularity of steam heat-tracing is declining. Steam is more expensive to install and maintain than electric resistance heaters. Periodic leaks and failed steam traps in a steam-traced system waste energy and demand additional labor costs for repair and replacement. In addition, a single steam tracer provides 2 to 10 times more heat than most applications require. By contrast, electric tracing systems provide better temperature control and much more efficient utilization of energy. This means that even though the cost per unit energy is lower for steam, total energy costs for electric tracing are usually significantly lower. In most heat-tracing applications, saturated steam is supplied at pressures of 30 to 150 psig (210 to 1035 kPa) (298 F/147 C and 367 F/186 C). The ability to continuously remove condensate via a steam trap assembly allows the steam tracer to provide a constant-temperature source of heat. The overwhelming majority of steam-traced piping systems employ external tracing. 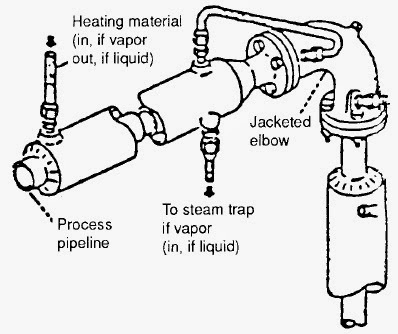 Straight runs of the steam pipe or tubes are attached to the pipe, and the entire assembly is covered with preformed sectional insulation (see Fig. 1). 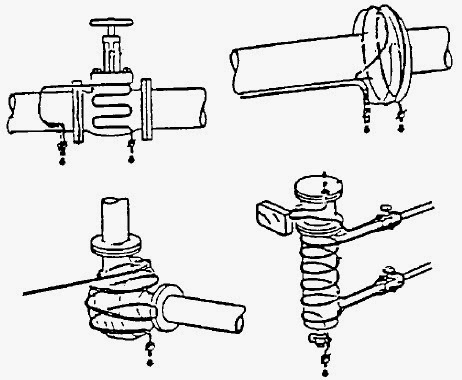 Valves, fittings, and instruments are heat sinks (system components of large surface area and exposed metal surfaces to which system heat will flow and be lost to the environment); and to deliver the requisite amount of heat, several loops of the tracing tube are coiled around them before being covered with insulation. This configuration helps reduce tailing, i.e., the tendency of steam to lose heat and condense along the line with loss of pressure (see Fig. 2). ‘‘Coiling’’ arrangement for tracing valves, flanges, casings, and instruments. Coils act as expansion joints for steam tracing systems. In the majority of applications such as freeze prevention and viscosity maintenance in smaller-diameter pipes, a single tracer provides more than the required heat. However, for processes requiring greater heat input, the heat-transfer characteristics of steam tracers can be significantly improved by placing heat-transfer cement between the trace and the pipeline, greatly increasing the amount of surface for conductive heat transfer. Temperatures of steam-tracing systems can vary by as much as 10 F (6 C) between underground pipelines and 20 F (11 C) for pipelines running aboveground. The inability to achieve precise temperature control is attributed to three factors operating in tandem. 1. Saturated steam is delivered at the desired pressure by means of a pressure reducing valve. As the pressure is reduced, the saturated steam becomes superheated. The excess heat is rapidly dissipated in the system. 2. Uneven contact between the steam tracer and process pipe produces an uneven distribution of temperature. This effect becomes more significant as the temperature difference between pipe and tracer increases. When the steam becomes superheated, the temperature difference reaches a maximum. 3. Tailing also affects the temperature of the surrounding steam. 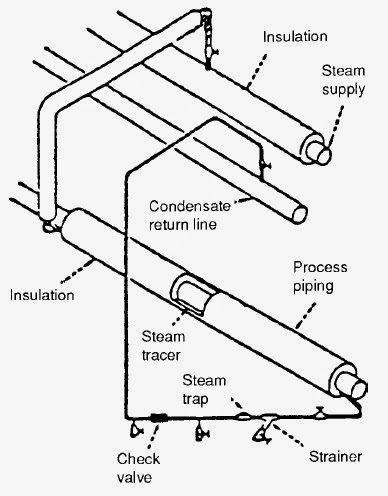 A more precise control of steam tracer temperature can be achieved by the use of steam jacketing (see Fig. 3) or temperature-sensitive steam valves. However, these methods are rarely used as they provide a level of temperature control inferior to that of electric heat-tracing, and at a significantly greater cost. Circulating media are the most expensive heat-tracing systems and are specified for special-process or ambient conditions (see Table A). The virtue of circulating fluids is the ability to provide protection and reasonable control at temperatures above and below those achievable with steam-tracing. Circulating media systems can be separated into two classes; oils and organic heat-transfer fluids suitable for high-temperature applications, and glycols with antifreeze properties that make them especially useful in cold climates, where they will not freeze even when used intermittently. At the outset, hardware had to be adapted from other resistance heating applications. Lead-sheathed soil-heating cable was used extensively for waterline freeze protection while longer runs of pipe were traced with mineral-insulated coppers heated cable. For higher-temperature service, tubular heaters (normally used for immersion and clamp-on applications) were converted for pipe tracing, and controllers were adapted from furnaces and consumer appliances in order to control temperature. Since their introduction in 1971, self-regulating heaters have become the most popular form of electric heat-tracing and are currently offered by most major vendors of industrial heat-tracing. Self-regulating heat-tracing has an advantage with respect to other heat-tracing products because this technology eliminates the possibility of heater burnout due to the inability to dissipate internally generated heat—the most common cause of heater failure (Fig. 4). Self-regulating tracers are usually provided in the form of a heater strip consisting of two parallel 20 to 10 American wire gauge (AWG) bus wires embedded in a conductive polymer core, which serves as the heating element and over which a polymeric insulator is extruded. The entire assembly is then covered with a metal braid to provide grounding and additional mechanical protection. Another polymer jacket can be added (see Fig. 4). The heater core consists of carbon particles embedded in a polymer matrix. Heat is generated by resistance to current flowing through the conductive polymer heating element.As the temperature of the conductive core increases, so does the electric resistance. 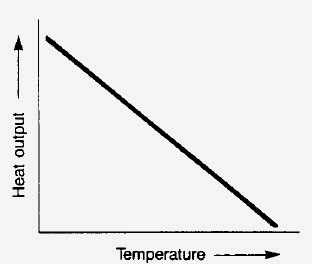 The result is a diminishing output of heat for each successive increment of temperature elevation. Since power output is a function of temperature at any location in the element, the conductive core behaves as a temperature-sensitive rheostat guarding against low- as well as high temperature failure (see Figs. 5 and 6). Self-regulating tracers can be cut to any desired length and field-installed within the limitations of the voltage drop on the bus wires. They have good impact resistance and are routinely handled in the field. The self-regulating feature provides a tremendous boost to operational reliability while cutting installation, maintenance, and energy costs. It also adds a dimension of safety unavailable with any other form of electric resistance tracing product because the heater cannot be destroyed by its own heat output. The only serious drawback of self-regulating tracers is the upper limit on operating temperatures, 366 F (186 C) for constant exposure and 420 F (215 C) for intermittent exposure. Self-regulating tracers can fail as a result of exposure to excess heat from the piped fluid or from steam cleaning. For this reason, the tracer must be selected to conform to actual process conditions. First introduced in 1971, zone heaters were initially the most popular form of parallel resistance heaters; and by the mid-1970s, they were being used in a large percentage of electric heat-tracing applications. Since that time, they have been increasingly replaced by self-regulating heaters. A typical zone heater consists of two insulated bus wires wrapped with a small gauge (38 to 41 AWG) nichrome heating wire, covered with polymer insulation and sheathed in a metallic braid covered with an optional polymer jacket. The heating wire is connected to alternate bus wires at nodes every 1 to 4 ft (0.3 to 1.2 m), and the distance between connections constitutes a (heating) zone. Heat is generated by current flowing between the bus wires through the heating wire (see Fig. 7). The parallel circuit configuration of zone heaters means that output is independent of cable length and that systems can be designed and adapted by purchasing cables of a specific wattage which are cut to length in the field. (It is important to remember that the length of cable between the cut and the nearest node will not receive power and should not be depended upon for heater service.) As a result, design and installation costs are significantly reduced. Zone heaters use standard voltages, and their parallel circuitry preserves system function in the event of individual heater element failure (see Fig. 8)—an important advantage over series circuits (see Fig. 9). Zone heaters use thinner resistive wires than series heaters and are more susceptible to damage from impact. Fiberglass-insulated cables are available with an exposure temperature up to 1000 F (538 C), but they are susceptible to moisture. The addition of a fluoro-polymer jacket for moisture protection reduces the exposure temperature rating to 545 F (285 C). Perhaps the biggest drawback of zone heaters is their susceptibility to burnout. With their combination of constant wattage and polymer insulation, zone heaters are vulnerable to destruction from self-generated overheating. As with all constant-wattage heaters, zone heaters to be used in hazardous (classified) areas require factory calculations to determine if the system conforms to the prescribed T rating. Mineral-insulated (MI) cable was introduced in the early 1950s as an electric powered alternative to steam and liquid heat-tracing.23 MI cable is a constant-wattage, series resistance heater in which the entire circuit acts as a continuous heating element. Heat is generated by current flowing through a nichrome, copper, or other metal conductor, insulated with magnesium oxide and encapsulated in an outer metallic sheath of copper, stainless steel, Inconel, or other suitable metals (see Fig. 10). MI cable is capable of carrying high heating loads. Given the proper conductor and sheath alloys, it can be used in applications up to 1500 F (800 C). Its high impact resistance and general ruggedness allow it to stand up to the rough handling in the field. Circuits usually are factory-fabricated to length prior to installation, which can be a source of problems when piping changes are made since cables are difficult to modify in the field. Field fabrication of circuits is sufficiently complex that the training of installation personnel should be supervised by a trained factory technician. MI cable system circuits must be individually designed, or variable-voltage controls must be provided to set circuit parameters. Voltage control may also be required for short lengths due to the low resistance. As with all series circuits, a single break in the cable causes the entire system to fail (breaks in the outer sheathing can cause failure due to absorption of moisture and subsequent loss of insulating properties). Another disadvantage of MI cable is the risk of overheating from excessive currents or poor thermal dissipation. Hazardous-area installations must be factory-calculated to ensure conformance with the proper T rating. Polymer-insulated series resistance cables can be used with various conductor materials. Nichrome is suitable for short circuits, but the length must be either predetermined to suit the available voltage or field-cut and provided with a variable-voltage supply. Conductors such as copper offer a measure of self-limiting heater properties, since their resistance increases with temperature. This allows greater latitude of use, and copper conductors with their 600-V limitation and relatively low cost (even with the mandatory metallic braid and optional over-jacket) are especially favored for long-line applications with this type of heater. The circuits must be designed and controlled to minimize high temperature, because a failure at one spot disables the complete circuit. The possibility of catastrophic failure (series circuit) due to overheating and melting of the polymer insulation puts this type of tracing in un-favorable competition with parallel resistance heat-tracing systems, which dominate in the low- to moderate-temperature application ranges. Skin effect systems are primarily applicable to the tracing of long pipelines. The skin effect is based on the tendency of an alternating current to flow in the layers near the surface (skin) of a current-carrying ferromagnetic conductor (see Fig. 11). In a typical skin effect tracer, the heating element is a carbon-steel pipe of small diameter welded to the fluid-carrying pipeline to be traced. 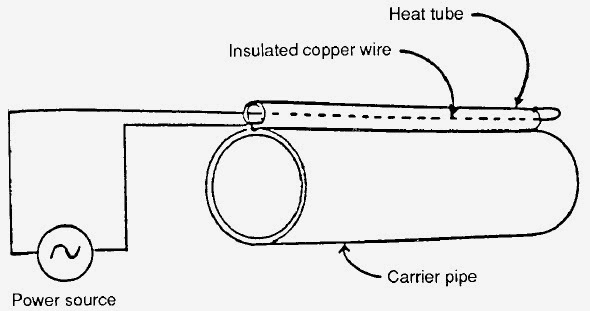 Running through the heat tube is an insulated, low-resistance copper wire. 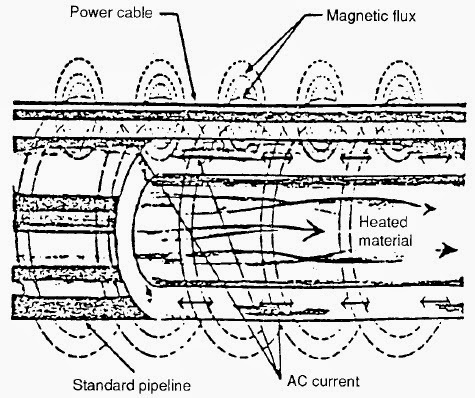 The alternating magnetic field created by this alternating-current-carrying conductor causes the return current in the small heat tube to be concentrated toward the inner wall of the tube. This phenomenon is called the proximity effect. 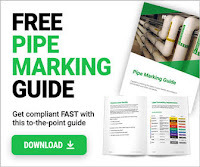 Because almost no current flows on the outer surface of the heat tube, there is no measurable potential there and the entire piping system can be grounded at any number of points. The requirement for custom system design makes skin effect systems costly, notwithstanding the ability to make use of ordinary low-cost materials, including prefabricated components and standard construction techniques. The method maintains a low-temperature difference between fluid and tube circuit wall (18 F/10 C), is considered reliable, and is easy to repair. Single-circuit envelopes of up to 25,000 ft (7500 m) are feasible with supply voltages of 3000 V. Higher supply voltages make even longer circuits possible. One reference reports a single power station capable of supplying service up to 30 mi (48 km) of pipeline. On the other hand, Carson qualifies this with a practical limitation of 10 mi (16 km), since above the 5-kV supply required for a line of this length, cable and switchgear costs become an increasing consideration. This seems to be confirmed by Ando and Takki, who report the construction of a 68-mi (108-km) skin effect heat-tracing system powered by 12 substations with a transformer voltage of 13,800 V.
Skin effect heat-tracing is generally not cost-effective for pipelines shorter than 5000 ft (1500 m), its upper temperature limit of approximately 400 F (204 C) is set by the maximum exposure temperature of the conducting wire insulation, and the method is not adaptable for complex piping. Installations cannot be modified, and the complete system fails with a single line break. In impedance heating, the pipe itself becomes the heating element. The generation of heat is produced by resistance to current flow (see Fig. 12). Impedance heat-tracing has the ability to reach very high operating temperatures, limited only by the design and contents of the piping system. Since the pipe is the heating element, it is the supply cable and connections which can be vulnerable to burnout. This technique has high heat-transfer rates and uniform heat distribution and provides excellent temperature control at the control point, using any one of several automatic control methods. Impedance tracing is costly and has limited application. Systems are almost exclusively vendor-designed, and the engineering can become complicated, especially in attempting to achieve an electrical balance in piping systems with multiple branches. Because significant current flows through the pipe, the entire pipeline must be electrically isolated from the support structure and shielded from personnel contact. As a precaution, impedance-traced pipelines are normally operated at 30 V or less. Voltages at 80 V are allowed if ground fault protection is supplied. Induction heat-tracing uses a metallic pipeline as a heating element by placing it in the magnetic field of an alternating-current source. Low-resistance wire is wound around a conductive pipeline or vessel, and the alternating current flowing through the coils generates a rapidly changing magnetic field that induces eddy currents and hysteresis losses in the pipeline wall. Induction heating has been most frequently employed for melting metals and most likely would be considered for high-temperature, high-power heat-tracing applications. The absence of thermal resistance between heat source and pipeline allows very rapid heating. Present systems would involve considerable expense and custom design and would require power inputs at short intervals along the pipeline. Induction methods do not easily lend themselves to the production of uniform heating, and IEEE rates the method as providing only moderate system efficiency.